If you’re sitting in that audience ready to fight me from the very beginning, I’m going to have a hard time getting to you. But if you’ve got a heart at all, I’m going to get it. This is our culture, and I don’t care who the musician is, if he avoids black people, then he is scared of something. He doesn’t have confidence in himself or else he doesn’t believe in what he’s doing. 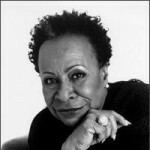 Betty Carter was an American jazz singer known for her improvisational technique, scatting and other complex musical abilities that demonstrated her vocal talent and imaginative interpretation of lyrics and melodies. Vocalist Carmen McRae once remarked, "there's really only one jazz singer only one: Betty Carter." In 1988 she won a Grammy for her album Look What I Got! and sang in a guest appearance on The Cosby Show. In 1994 she performed at the White House and was a headliner at Verve's 50th anniversary celebration in Carnegie Hall.